NES Aladdin (any, Hummer Team) in 12:50.28 by Kasha. 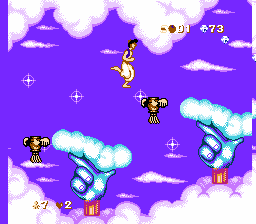 Aladdin (阿拉丁 in Chinese) is a port of the SNES version of the game of the same name, made by Hummer Team in 1995. The game is one of the more well known pirate ports, because it is very faithful to the original game and because it is a bootleg of very high quality, unlike other bootleg ports from more powerful platforms.